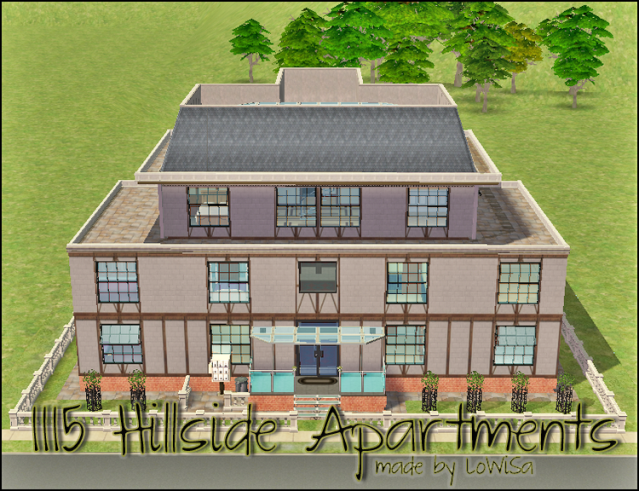 Today I want to show you my first apartment building I ever built. Pictures aren't good, my graphics card is weak as well as my abilities as an sim architect. My homes are not the prettiest, but they are effective and useful. I hope someone will like it. Apartments are partly furnished, but I used only Maxis stuff from all expansions and stuff packs I have. 5 partly furnished apartments for your sims (two at the basement, two at 1st floor and one at 2nd floor). Each apartment has 2 bedrooms, living room, kitchen and dining, bathroom and entrance hall. Corridors and outside is fully decorated. An apartment at 2nd floor has an entrance to the roof. Do whatever you want with in your game or use as a backdrop for your legacies or something. I bring you another apartments for your sims. My homes are not the prettiest and I know it, but they are effective and useful. I always test all of them when I play free game. I hope someone will like it. 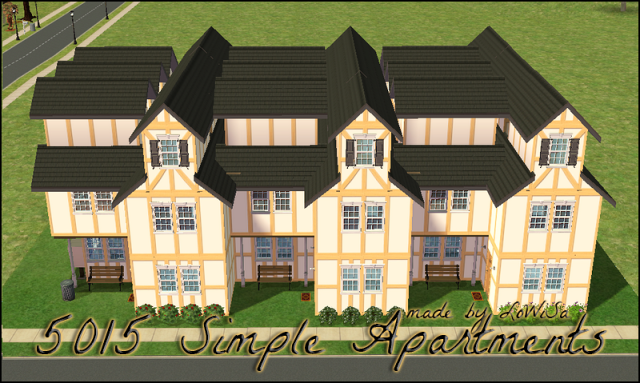 3 apartment units, partly furnished and decorated with Maxis stuff from all EP's. Each has kitchen+dining room, living room, 2 bathrooms, 3 bedrooms, hall entrance and small garden backside. 3 apartment units for your sims looking like a typical house. Each apartment has kitchen+dining corner, living room+study, 2 bathrooms, 3 (bed)rooms and a small garden in a front of the house.